20 October, 2009. 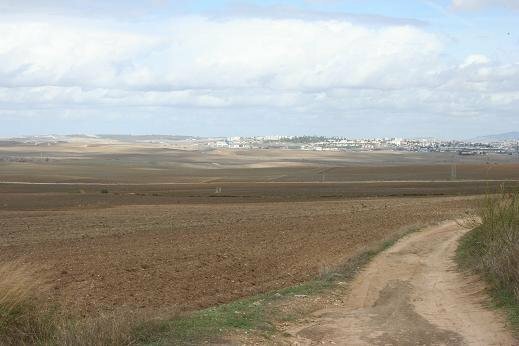 Day One: Cadiz - San Fernando (14 km). *Left luggage: available at Prado San Sebastian, Seville in the Consigna office. 2 euros per day. *Credential: Amigos del Santiago de Compostella de Seville. c/ San Jacinto, no. 25, Portal 6. It will take about 55 days or so to reach SdC. One credential has only 40 stamp spaces. I asked for two. *Transport, Seville to Cadiz: bus from Prado de San Sebastian Bus Station. Ticket office opens at 6.30 am. A direct bus departs at 7 am, cost 11.40 euros. Drop off point is directly outside the old city walls. *Cadiz tourist office: free inner city centre maps available for Cadiz, San Fernando, Puerto Real and Jerez de la Frontera. Unable to obtain others along the way. The officer was unwilling to book accommodation ahead. I don´t know if it was just this officer or a general rule. *Google maps: invaluable help along the way, particularly in entering and exiting towns. Not all towns have tourist offices so I was unable to get street maps after Jerez de la Frontera. I relied on Google maps for locating hostals previously searched out. 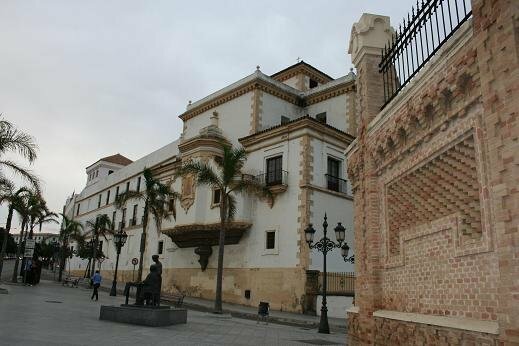 Most of the accommodation listed in the Guia de Cadiz a Seville can be found online. The yellow arrows cease before most towns and start again in the outskirts, sometimes a few kilometres walk from the centre. *Cadiz sello: Hospital de Mujeres located in a street of the same name, directly behind the covered market beside the Correos. Sello also available at the tourist office. *Getting started: la Iglesia de Santiago (the altar piece includes a carving of Santiago on a horse). Stand with your back to the church and turn right, to the sea. The first yellow arrow (flechas) is painted on the curb. *Accommodation: San Fernando, Calle Real. 33 euros for single. Very nice. Next door to a grocery store. The adventures of a jet-lagged Kiwi, or in other words, how not to begin. The best advice that I can offer anyone embarking on this great adventure is spend a few hours learning directions in Spanish. 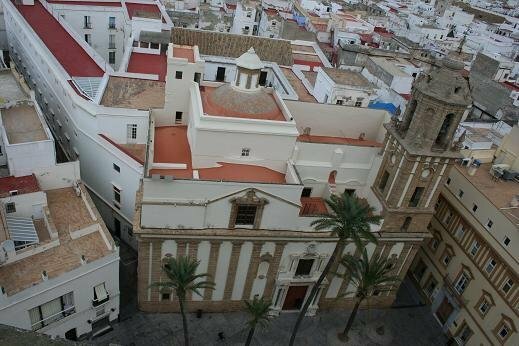 Arrive a day early and explore Cadiz at leisure, absorb the ambience, climb a few towers to situate one´s self then start out in a happy, peaceful state. What a pity I didn´t do this myself. Covered in hives, jet-lagged and swooning in the heat I staggered my way around Cadiz searching for an alternative to the tourist office sello. I chased around, was shrugged of by someone at the cathedral and eventually directed to an office where a good man came to my rescue. As well as directing me to the Hospital de Mujeres he read page one of the Guia and told me to always keep the sea to my right. On entering la Iglesia de Santiago I found myself participating in mass. Knowing only 10 words of Spanish, this was a curious experience. When others went forward for the Eucharist I decided to go forward too and ask for a blessing. The elderly priest, gorgeously attired in green & gold, looked at me. Not sure what else to do I blessed myself and he followed suit. Without altering expression or saying a word we choreographed a prier a deux. I don´t know about the priest, but I found it meaningful. He disappeared instantly after mass and that was that. The forecast was for torrential rain. As it was clear when I arrived I saw an opportunity to avoid getting drenched. After eating lunch on the cathedral steps I headed off from la Iglesia de Santiago walking miles by the sea. In the first few minutes I saw two yellow arrows then after that no more. The Guia map indicates that there is a path along the isthmus to the left of a railway line all the way to San Fernando. I expected an arrow or two to assist me in crossing over to this but there were none (that I could see). All the Spanish words in the Guia jumbled before my eyes and I just couldn´t think. ´Keeping the sea always to my right´ as earlier advised I arrived at a conniption of motorway exits and entrances and couldn´t get across. A cyclist directed me to a foot path and tracks through the dunes to the right of the motorway so this is where I walked for the next 6 km. Half way along the isthmus I came across a military base and the guard indicated that I could continue walking all the way to San Fernando, only from here it was on the outside of the motorway barrier over rubble and all the detritus of Spain. Wetlands were to the right and finally I reached a petrol station where a proper footpath took me eventually to Calle Real and a bed for the night. *Road works the entire length of Calle Real and beyond Puente Zuazo. Lots of mud. *First flechas: at the end of Calle Real. No problem exiting San Fernando. Guess work on the new muddy road, which turns right immediately before ´Compra Venta´ , an old homestead. Next flechas high above on a concrete overpass then scary walking crouched in the gloom beneath two motorway bridges. *The tourist officer in San Fernando speaks English. The path indicated in the Guia was unknown to her. She gave me a walking map of the region which included a portion of the Camino between Puerto Real & El Puerto de Santa Maria and also the bird life which might be observed. We agreed that if I had difficulty getting beyond the extensive road works beyond the Puente Zuazo then I would return and catch a train to Puerto Real. *Sunrise: after 8 am. Walking practicable by 8.30 am. High humidity, 13 degrees c. by 8 am. A sauna by noon. Heavy rain before dawn but none during the day. *Road walking, lots of mud, then tranquil canal walking and eventually a walk through pines. Entering Puerto Real is dangerous as one has to cross a motorway maze and climb over the barrier. There is a grass verge after that and a long walk into town. Signing good. *Accommodation: Puerto Real, Hostal Bahia de Cadiz. 30 Euros. Adequate. Opposite la Iglesia Santa Maria la Mayor. Pink Flamingos and how not to get lost. Determined to give it my best shot I awoke before dawn and spent a few hours pouring over the Guia with a phrase book. When desperate it is amazing how much one can learn. I now recognize Spanish for ´turn left, turn right, arriving at, after and before´ and a few more words such as Calle, Puente, buscado and hacia. Feeling hopeful I started out, had a friendly chat with the tourist office staff then strode off. What remains in mind as I reflect on this day are the rich autumnal hues as I passed by wetlands, the lovely silvery gloom looking back over Puente Zuazo to Puerto Real and the river, and the romance of russet coloured ruins. The delight of the day was a flock of pink flamingos drifting in the water and the brilliance of feathers when they took flight. Unfortunately they were too far away to do justice with film. *Signs easy to follow. Care needed after the bridge outside Puerto Real. The Parque Metropolitano Marisma is immediately to right before the Univercity entrances. Care is needed in navigating rotundas and the motorway on entering Jerez de la Frontera. *Have a siesta after El Perta de Santa Maria. It´s a long day. *8 am still dark. 17 c. by 8.30 and temperatures climbing. *Accommodation: Jerez de la Fronterra, Hotel Nueva. 25 euros. Tranquil, lovely 19th century mansion centrally situated not too far from the Camino. 4.30 am What a noisy building this is. Every sound my neighours below, above and to the side make resonates in my concrete room. Not only that, my chamber opens onto an inner courtyard shared by others. There´s a half naked grisly man lounging out his window smoking, making telephone calls and talking loudly. I´ve kept the curtains pulled and stuffed earplugs in to blot him out. Today began in the driving rain. Leaving Puerta Real an African man greeted and complimented me on my excellent poncho. I saw him last evening selling umbrellas on the street, an array spread out on a mat for pedestrians to buy. After a while the rain abated and the day turned into a fine walk. Now, at the end of the day I´m finding it taxing to think. It took 7 hours to reach Jerez de la Frontera, the cool dawn turning into a scorching fire. Taking photos in the Parque Natural after Puerta Real was a dance between the wind, the camera and oblique rain. 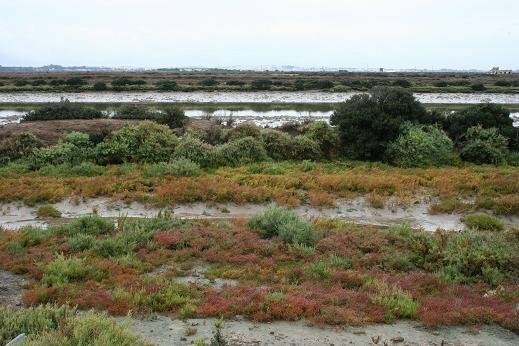 This walk through pines and past former salt pans was serene -squawking, chirping bird life spiralling across a marshy landscape with El Puerto de Santa Maria gleaming white in the distance. Motorway and footpath walking followed after the bridge at San Pedro, and more of the same followed until after El P. de St. Maria where the magnificent Antiguo Monasterio de la Victoria is situated by the road -a prison-like cell block juxtaposed with a romanesque/gothic church. No entry. Just after the Casino, where, incidentally you can eat all hours, I stretched out under a bush, flat out on my poncho and a large NZ rubbish bag. Whiling time I gazed at the heavens, seeing crazy angles and crazy ephemera. From here to Jerez the scenes were vast. Climbing up, to the right was the sweeping Bahia de Cadiz then over the rise to the left awesome arid landscapes with Jerez rising in the distance. *Signing disappears after the over bridge, about half way between Guadalcacin and Nueva Jarilla. Somewhere there begins a broad track parallel to the AP IV. *This is a very long day in the searing heat. No water available. *Entering El Cuervo the signs guide you across town and out the other side before you know it. On reaching Parque de la Juventud turn left down Avd. Blas Infanta and go to the very end to Avda Jerez and Nat. IV. 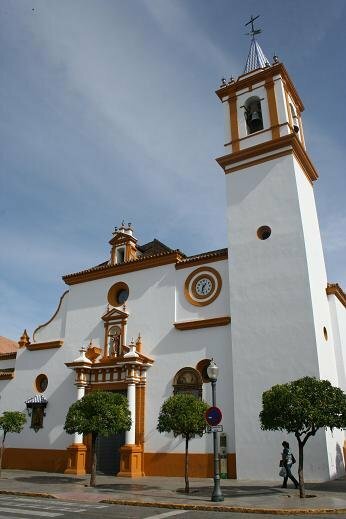 Turn left, heading towards Jerez, after a while you arrive at Hostal Santa Anna and the Parroquia de San Jaun. Retrace your steps back the next morning to Parque Juventud. I was tempted to just walk the motorway the next morning to get to the turn off to Lebrija, but am glad I didn´t. The turn off isn´t signed and the road is heavy with trucks and trafic early morning. *Accomodation: Hostal St Anna, 15 euros. Adequate. Nice hostelier. Lots of street noise. Directly opposite Parroquia de San Juan. It took 1 1/2 hours to finally reach the countryside after Jerez de la Frontera. Much of this was spent walking down an avenue lined with orange trees to the left and palm trees down the centre. Eventually I came to a dangerous roundabout where I had to cross over the road to head towards a narrow railway overbridge. My heart sank and I felt faint when I realised that the dusty obscure arrow did indeed indicate that I was to walk head on into the path of traffic shooting off the curve at the bottom of the bridge. Mustering resolve I stepped out and traversed inch by inch, turning my back on traffic when I got scared. After the bridge arrows eventually led to a muddy track through farm land, ruined buildings and trash. 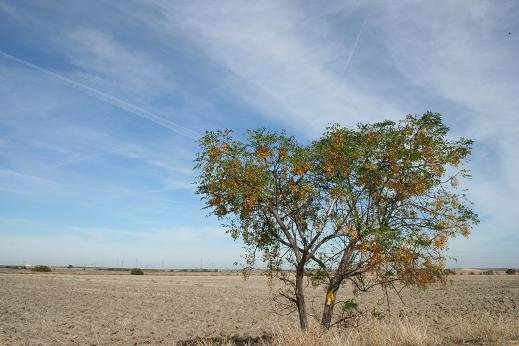 It seemed forever before another flechas appeared and then it guided to a newly tilled trackless field. Guessing, I traversed the edges of the feild and scrambled through overgrown reeds to discover an ancient concrete aqueduct/irrigation pipe with an arrow, viscious dogs and a derelict part of civilisation. Afterwards, in the escalating, draining heat an age of dusty road walking followed and the arrows disappeared forever. 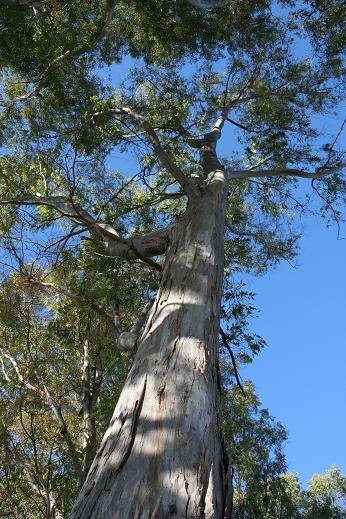 I love siesta time -boots off, flat on my back, gazing up at the sky through leaves, the only trees for miles -a stand of eucalyptus in a dusty hollow filled with broken concrete, dessicated thistles, spiders and litter. I had finally come across an arrow indicating that I cross over the bridge -underneath ran the AP IV. I camped out with relief. The Guia map indicates that after this crossing there is a track running parallel to the Autopista IV for many kilometers. I didn´t find it. Without realising I walked several kilometers off course along an asphalt back road through farm land, the AP IV sort of parallel. It was only when this road turned sharp left that I realised I was not where I thought. Fortuitously a group of cotton labourers appeared and I was guided along fields to a broad track immediately to the right of the AP IV. Where were the arrows? How come I didn´t find this track immediately after crossng the overbridge? 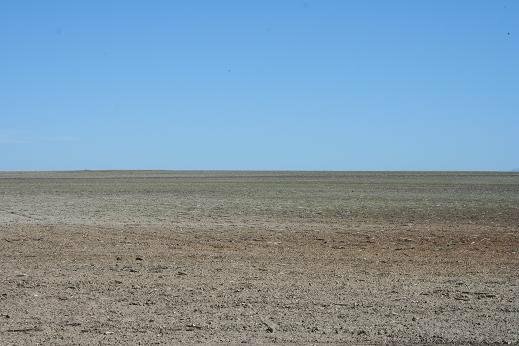 Finally, more hours passed in the ferocious heat, arid plains beneath expansive skies, cracked earth and delicate shadowing on gentle rises below interesting clouds. The constant buzz of motorcars to the left. And No Shade. After an underpass, signed El Cuervo, came mud, a vine yard and the El Cuervo town dump. All of Spain seems to fly tip and turf litter out their windows. Every day my way has been decorated with refuse. Just when I´d had enough, when I was sick of walking in the stench a captivating moon scape loomed by the Way. A mystical dessert-like vista appeared to the left, a mamoth castle-like skycrapper looming Oz-like out of barreness (is it a 20 story prison? in the middle of no where?) and then came the back streets of El Cuervo. *Exit El Cuervo via Avda Blas Infanta, turn left at Parque de la Juventud and follow the arrows out of town. *Signing is inadequate after Balso de Milendo. Care is needed after the canal and approaching the dump before Las Cabezas de San Juan. There are several cart tracks in this area but I kept heading left, eventually reaching the dump. Signing disappears on reaching the square where la Iglesia de San Roque is situated. 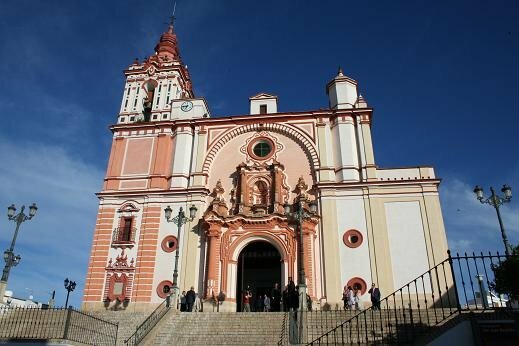 I needed a google map to navigate uphill to Iglesia de San Juan Bautista and beyond to find la Plaza de Andalucia and the Camino route indicated in the Guia. There are no arrows up there. *Accommodation: (Guia listing no. 1.) 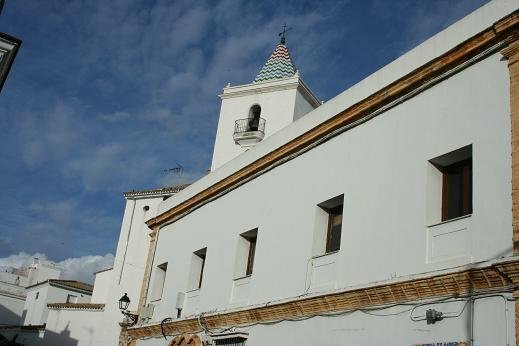 Pension La Abuela Emillia, Avda Frederico Garcia Lorca no. 17-19 is no longer there. (Guia listing no. 2.) Hostal el Cruce, Ctra. Nat. -IV. According to a service attendant this hostal is 7 kms out of town. the sevice attendant drove me round town, asking friends for a place that I could stay. I waseventually offered accommodation at Alojamiento Temporal, Avda Frederico Garcia Lorca no. 1-3, phone 658 96 37 37 -a pub on the corner of the square. 25 euros. Beautiful upstairs apartment with kitchen & washing machine. It took two hours from Hostal Santa Anna in El Cuervo to reach the outskirts of Lebrija. In that time I was wowed by a gorgeous sunrise and accosted by a fomenting, viscious pair of skeletal dogs. Indeed, El Cuervo does have a refugio but it is for 200 abandoned ematiated grey hounds. 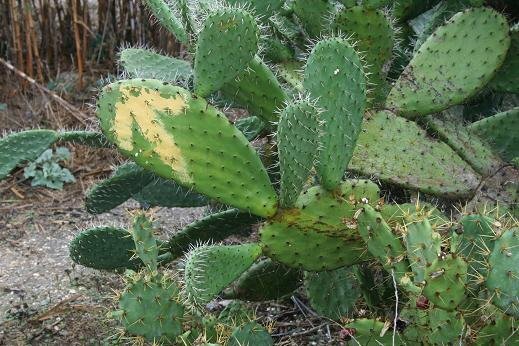 If you google ´El Cuervo refugio´ you´ll find a u-tube video full of sorrows: Dogs on their last legs, eyes glazed, teeth enormous in shrunken gums, skins covered in sores, dusty and manged. Unfortunately these two had escaped the dog-saviour´s net and for over five minutes I was terrorised by a weaving demonic whirl of razor bones, frenzied jaws, mean tails and bloodshot murderous eyes. I kept walking straight on, not flinching, eyes lowered. Just when I thought it was over the pair thundered up from behind yowling. They prodded the back of my boots and knees slobbering rabid ooze before racing ahead at 100 miles an hour, about turning then charging from the front. The instinct to chase must still be strong in these old race hounds and I think ,esentially, I was just their elusive ´rabbit´ , something to chase but never attain. I do have hiking poles but they were strapped to my pack. No way was I going to stop and unstrap them or reciprocate this canine aggresion, I didn´t have the courage. On a previous long distance walk I had done just that and been bitten by a rottweiler. The damage took weeks to heal and my leggings were ruined. It took 30 minutes to walk into Lebrija, make a 90 degree right turn and walk out the other side. Nothing of interest along the way bar water holes and food joints. Balsa de Milenda is a fenced in allurring water reserve. I found an opening and rested under a bush by swaying reeds. The next three hours walking were unsigned and an endurance test in scorching heat. Temperatures soared. There were no trees for shade, only clumps of reeds rattling in the wind, an expansive scene under brilliant skies. 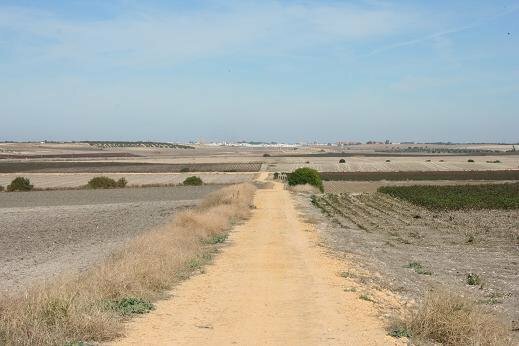 To the left ran the elevated Renfe track and to the right miles of sun-baked agricultural land. 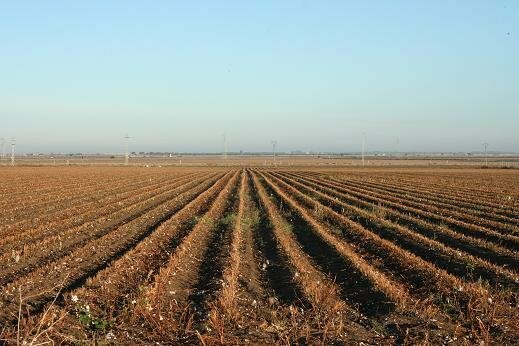 Cotton feilds were being harvested and other feilds were bleached & fallow. After 7-8 kilometers the path was blocked. A new earth barrier had been dumped across the road and I could not continue. I detoured by climbing arround a small white shed, traversing a field then climbing up onto a canal bank. This I walked carefully, worried that the erroding surface would collapse under my weight. I could see a tractor not far off and a dirt road leading up to a bridge but couldn´t access it without inching my way up, over and arround a 4-tunnel concrete water drain. When I finally reached a safe surface there was a yellow arrow on a building the other side of the bridge. This area definitely needs re-signing. After this las Cabezas de San Juan could be seen floating in the distance. Many cart tracks crisscrossed the flats, but I kept left, arriving at the local dump. There were yellow arrows but at times obcure. These lead into Las Cabezas and halted behind the square where is la Iglisia de Roque. 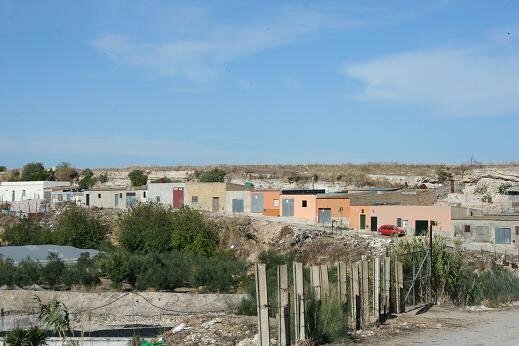 The Pension listed in the Guia is no longer there. The Hostal el Cruce is apparently 7 kms out of town. I approached the local petrol station attendant and his offsider kindly drove me about town asking his friends where I could stay. They directed him to a pub on the corner of Avda Frederico Garcia Lorca, no. 1-3 and I was given a lovely upstairs apartment for 25 euros. Later I followed the streets mentioned in the guide book and came upon elegantly attired guests arriving for a wedding at the Iglesia de San Juan Bautista. The paprazzi were out with video cameras and enormous zoom lenses. I would love to have taken a few inspired shots of the bride and her mother who wore full length black lace manitlla with soaring head piece, but I didn´t want to get in the way of the proffessionals. The only views I took were back end. I stood behind a pillar in the church watching and listening a while then continued my way. *Signs at the first canal indicate walking on the right side but the Guia map indicates walking to the left. I chose the left side following an established gravel track. Yhis side was later signed. Signs at the second canal indicated walking to the right but the map again showed to walk on the left. This time I could see more arrows on the right so stayed this side. *There was very little shade and a relentless dessicating wind blew all day. *No water available along the way. 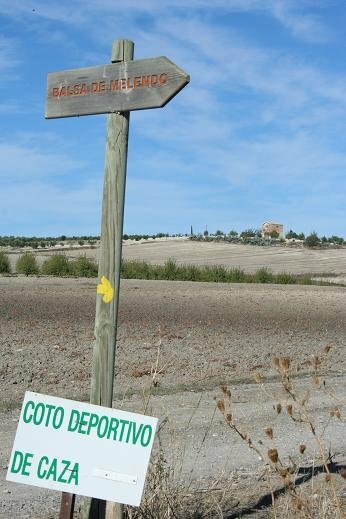 *Signing stopped outside of Utrera. *Accomodation: AMR Hotel (budget blown, I´ll have to sleep out or eat beans for a month) 60 Euros. Sunday, and I remembered only as I awoke predawn. All shos are shut. Thankfully I had left-overs from the night before and nuts and dates to get by. 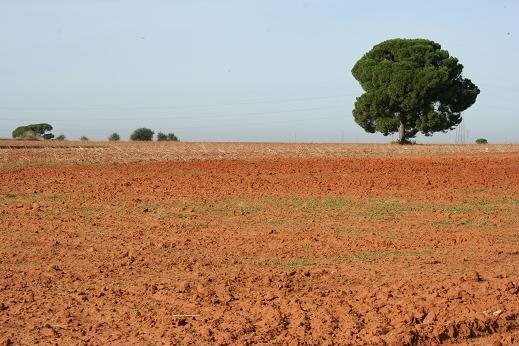 I wasn´t sure how I´d fare when I finally reached Utrera, but when I did I was blessed: Sitting outside a pub, parched and dusty, wondering which hostal i should approach a young lady with children came by. She and her friends invited me to tapas and plied me with many bottles of iced water. We had lots of fun sharing experiences and getting aquainted. The friends were mostly nurses and between my 25 words of Spanish and their 2000 in English we managed very well. The hostal I hoped to stay in turned out to be quite a distance away and my new friends insisted on escorting me to a hotel close by the cathedral. I was sorry to see them go. On reflection, I remember mostly the tranquil walk through olive groves and resting in the cool upon arromatic pine needles. After that it was a determined effort in the heat, my feet saturated inside gortex boots purchased for Galicia. *No signing out of Utrera. The Guia lists which streets to walk out of town but I missed the sign for Calle Vera Cruz, opposite the Vera Cruz Hostal, and walked 30 minutes further until the autopista. Following Calle Vera Cruz arround eventually leads to an over bridge with steps up the rear side. *The first yellow arrow appeared by the steps decending the other side facing the cemetary. 8 km´s along a lovely tree-shaded track through olive groves followed by 8 kms traversing private property without shade. Heavily chained gates blocked the entrance and exit to the private land. I was able to squeeze arround the entrance and continue but at the end couldn´t get through the exit fence or gate. Fortunately a farmer drove up on his tractor and unlocked the gate for me. I don´t know what I would have done if he hadn´t seen me. Yellow arrows lead the entire way through this property and out the other side, continuing on fence posts beside the railtrack. 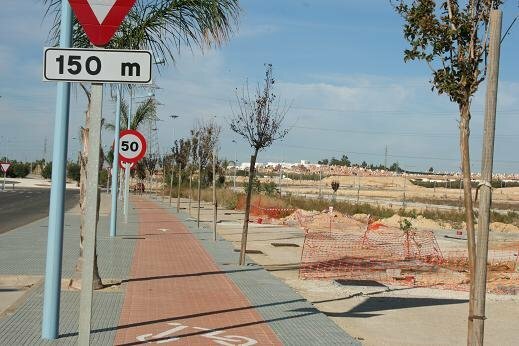 *Signing disappeared before the overbridge before Dos Hermanas. I took a guess and turned left, traversing the side of a field. At the very end an obscured arrow directed me up to the path into Dos Hermanos. Arrows lead the entire length of Calle Cerro Blanco then disappear at Plaza de la Conception. No signing out of town or anywhere from there to Seville. *The Guia map indicates extensive road works and excavations. I visited the Ayuntamiento for advice. They located a fluent English speaker and she assured me that the road to Seville had now been completed. Getting out of Dos Hermanas was tricky. The rest of the way to Seville I followed the new cycle way beside the motorway to the outskirts of the city. The smooth surfaces were brutal. It was impossible for me to go through the motorway tunnel so I caught a bus from outside the La Guardia, signed at the last roundabout by Bellevista. I was shattered by this time and couldn´t go further. Perhaps there is a way through Bellevista & the Hipodrome but someone else can write about that. *Water: I drank 5 litres of water this day -one before starting out, two litres to Dos Hermanos where I filled up in the Ayuntamiento Ladies room, then two litres getting to Seville plus more during the night. The forcast early morning was for 30 degree c. In the open it far exceeded this. As well as wearing my hat I used my umbrella as a parasole, wore a longsleeve silk under shirt and covered most of my face with a cowl/bandana. A complex caring African man greeted me today in Dos Hermanos. He saw that I was very far from home and voiced concerned. He offered food, shelter and even a train ticket to get me to Seville if only I would stay with him a little while. We talked a while but as a woman alone I felt too vulnerable to accept his hospitality. I was touched by his kindness and promised to pray for him as I walked to Santiago. He, too, was a very long way from home and most probably a refugee or assylum seeker. God knows what it took for him to land in a place like Dos Hermanos. He thought I was crazy to keep walking to Seville that day but my heart was set on it, so off I went. A couple of elderly ladies happily escorted me through the maze of streets listed in the Guia then left me to make my way. The rest of the walk is a brutal blurr. With great relief I arrived at my home away from home, the Seville Urbany Hostel, and here I have stayed for the next three nights resting up, eating huge, and sorting out practicalities for the journey ahead. Tommorow I´m off again, this time along the Via de la Plata. Your accounts are fascinating to read - keep them coming! I so admire your courage and tenacity walking this "road less travelled" alone, and obviously you have an open heart as so many people want to help you! You will love the VDLP and I look forward to hearing about your experiences there! Lovingkindness, you are a trooper! The Via de la Plata is marked better from Seville... but there are a few places where the flechas amarilla (I think that is how you say "yellow arrows") are not frequent. I ended up following the N630 highway when I lost the arrows. I don't know what guidebook you are using, but there are several English guides to the VDLP. And albergues... almost every night. There should be the occasional other pilgrim. Not the alone-ness you experienced from Cadiz. Drinking 5 litres in a day!! I knew it was hot! But 5 litres! Don't let your body run out of salts. In Canada there is a powder called Gastrolyte for people experiencing de-hydration. The magic ingredients are sodium and potassium. I don't know what the Spanish equivalent is but a pharmacist who speaks english can figure it out with you. I made a point of drinking 3 measured litres per day, plus a couple bottles of coke in bars. Don't wait until you are thirsty to take a drink. Frequent small drinks are best. Not wanting to sound bossy, or doubting your ability. Just a tinge of jealousy and fond recollections from my walk on the VdlP. I send you "Good Camino vibes" and wish you a successful journey. What a special sight to see those flamingoes. I am amazed to read about how hot it is in the south. I guess the 'cool' walking season there is not so long! I know this is a smart alec question but could you not get a boat from Cadiz to Puerto Santa Maria? I know the Cadiz area well and while I admire your pluck the section to PSM of flat, flat, flat salt marsh with the occasional 3 or 4 lane highway is not one I would have chosen. I may have mentioned that when we did it we took a more easterly route via Medina Sidona and Arcos. I am fascinated by you posts, keep them coming. There is a way into Seville (out when we did it). On the main road!! I do not blame you for not taking it as it is horrid. 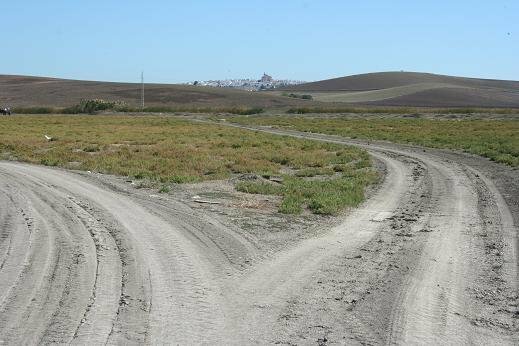 There are some pretty rough areas like las 3000 viviendas in the South of Seville so the main road was our choice. This is good advice particularly when temperatures soar. I'm sure there are several brands - the one I use is Sueroral Hiposodico - available in most farmacias. Hey, that´s exactly what I thought when it began to rain, Day Two, and later, after the event. The perfectionist in me loves the completeness of looking at a map and knowing that I´ve walked every inch from one point to another (lets forget the bus from the outskirts of Seville). That is why I chose to walk from Cadiz all the (at times dreary) way to Puerto Real. 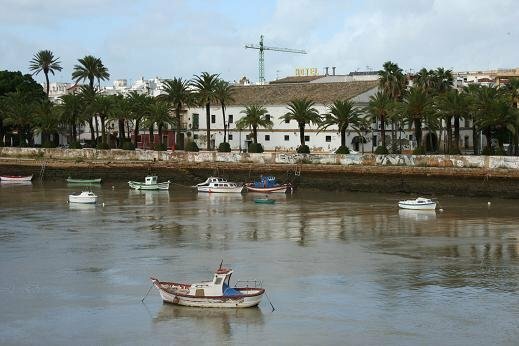 Like you, Alison Raju suggests in the CSJ website that taking the ferry boat from Cadiz across the Bahia is a valid option. But, you know how it is.....I just wanted to see what was out there, no matter what. Thanks for the advice Johnnie and Skilsaw. I have just arrived in Salamanca. The blistering heat persisted from Seville until Castilblanco, where 36* Degrees Delcius glowed demonic red on the Farmacia thermometer, 4.30 pm. Out on the VdP, in the open, it must have been well above 40*. A day after Castilblanco the thermostat switched to cool dawns and manageable days so I felt no need for extra salts. Yes, it would be a very wise thing indeed to imbibe Gastrolyte or it´s equivalent along the Via de la Plata. In future I´ll take some with me when I hike in hot climes. Thanks, again. Regards, Lovingkindness. Hola. Here are the photos as promised. Days One to Three were overcast so the colours are a bit drab. Cheers, Lovingkindness. Beautifully evocative photos- thanks for sharing them! As someone who has walked the same route as you (from Seville anyway), I hope you'll post them somewhere LK, as I am one who IS interested. I hope your beautiful photos and equally-beautiful writing will lure many people on this forum to this less-travelled path. I take it from your post that you have finally made it to Santiago - well done! I second Isabelle's request. It would be lovely if you can post your photos somewhere and provide a link for them. I would be most interested to view them. I have not walked this route but hope to, in the years to come. I had followed your account of your journey from Cadiz , on this thread and the other (Walking in Winter). I had enjoyed them tremendously (love your sardonic sense of humour!). Thank you. Feliz Navidad. And may the new year bring you lots of love, joy and laughter. Thanks for this excellent trip log! I am considering this route or the one from Huelva. I am glad that you broke it down into smaller stages, I prefer shorter distances in the beginning. Any advice from folks who've walked it since 2009? In March this year (2012) Dave54 hiked from Cadiz. Here is a link to the thread where he posted notes on his experience. Bjorgts who initiated the thread also hiked from Cadiz earlier this year. I haven't read anything here yet about her experiences. Why not send her a PM to ask how she got along. I'm on theVia Augusta, just arrived in Puerto Real. Arrow signposting has dramatically improved, there were arrows, either painted, or beautiful glazed tiles, everywhere. Staying at CasaTeo, a pension. Dbl room ensuite, 40 euros. Like you in 2009, we got totally soaked today in a rainstorm. Otherwise fine weather, not too hot. All still there I believe. We stayed at Fenix hostel in Jerez. The iglesia santiago in jerez, is polished and quite empty on the inside, and still weathered on the outside. of toiletries, incl combs, toothbrushes and sanitary pads. And blankets. If you have your own sleeping bag liner and towel, you are comfy here. Hot shower and toilet on the other side of the church building. Wow, your walk didn't sound too good. For us this stretch was not a favourite either, although it had highlights. We walked to Lebrija early, to have breakfast there, it was 8km, through fields and flowers. Quite nice. In Lebrija there was a good breakfast restaurant, La Venta de Luis Rey, just before you turn the corner to get ouf of town again. After the lovely lake, with lots of birds (spoonbills, egrets, etc. ), the canal was a tough one. Despite it being April, and not too hot, it was a long slog, with no shade at all, which then turned into a wide area, with (dried up) mud tracks, but again, vey well signposted. When Las Cabezas de Juan was well into sight, we came across what looked like an abandoned farm complex, but there were vicious dogs, barking. Very scary, so we strayed off the path a bit, went behind the buildings, lots of rubbish there, and found the path again, which then went through an overgrown part next to a field, to lead over the highway into Las Cabezas. I think the apartment where you stayed is the same as ours (Hostal Las Cabezas), as the address is the same, and it was wonderful! We had a penthouse style apartment, fully equipped, decoratedin 'rock' style, with guitars on the walls, and a huge roofterrace, overlooking the square and the churchtower, which had a stork's nest with babies in it. 20 euros pp. Update for 2019: We met another pilgrim the day before, the first and last one on the Via Augusta, and he had decided to take an alternative route, more to the left. We decided to diligently follow the arrows, so ended up along the same route that lovingkindness followed. It was mostly following the railway, but since there was only about one train per hour (or fewer) it was very quiet and peaceful. There was no shade at all, which was ok for us in April, but in Summer it must be unbearable. 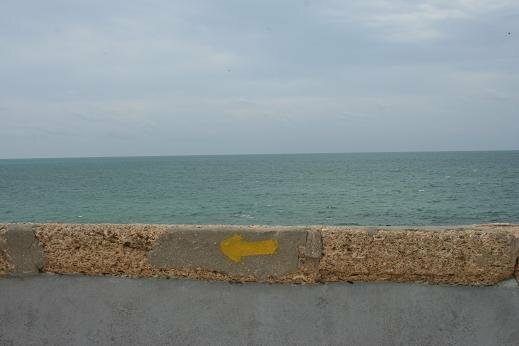 At some point a yellow arrow pointed to Trajano, a village about 1 km away, but our online guide from the Association of St James of Cadiz said we had to go straight on. Didn't want to walk an extra 1 or 2 km, so decided to ignore Trajano. It is the only place on the way though where you could get water or even a snack. There is a bar there. 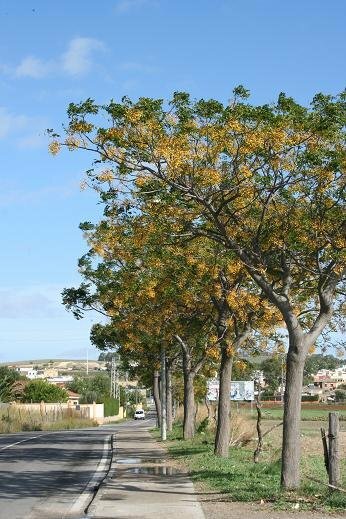 At some point the Camino veers off to the left and you enter Utrera on a flower-lined country path. Our fellow pilgrim had not been so lucky we heard later: he had spent the last 5-10km walking along a busy road. Utrera is beautiful, and we stayed at the hotel Veracruz (80 euros for a double room, splashed out!) as the other hostals seemed a bit out of the centre. So, you made it to Seville, @Zen Librarian. Well done! I've enjoyed reading your comments. Thanks again for posting. Same here, thank you for writing 10 years ago! I loved reading your story and compare. Not that much has changed really. Guide for Via Augusta, Cadiz to Seville?